Pictured here are climate scientists processing ice core samples in the East Greenland Ice-core Project (EastGRIP) science trench 10 m under the surface of the Greenland ice cap. 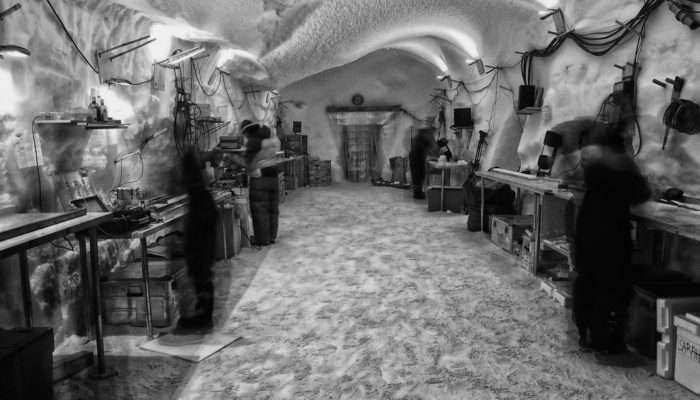 The trenches of this ice core camp require minimum building materials, utilising giant inflatable balloons that are dug in and covered with snow. The snow is left to compact for a few days, thereafter leaving back an arch-shaped underground trench ideal for ice core processing activities. At this site, an international research consortium of ten countries led by the Center for Ice and Climate at the University of Copenhagen is aiming to retrieve an ice core from the surface of the Northeast Greenland Ice Stream, a fast-moving ribbon of ice within the Greenland Ice Sheet (GIS), all the way to the bedrock (approx. 2500 m). Contrary to previous ice coring sites from the ice divide of the GIS, the EastGRIP site is a very dynamic place with a surface velocity of 55 m/year. Ice streams are responsible for a significant amount of the mass loss from the GIS, however their properties and behaviour are currently poorly understood. Having a better understanding of the streams’ features will allow for more accurate estimates of how the GIS accumulates and loses ice under current conditions as well as in warmer climate scenarios. In order to understand the behavior of the site better, scientists carry out a series of state-of-the-art measurements on the ice core. They examine the physical properties and grain structure of the ice, as well as palaeoclimatic parameters, such as water isotopic ratios, gas concentrations and impurities. This research is often run by novel analytical methods that were specially developed in-house by members of this project. This constitutes a massive effort in terms of ice core sampling and measuring, a large part of which takes place in the field. In weather-protected trenches under the surface of the snow, scientists process the ice core, part of which is measured on site. The rest of the ice is flown out of camp and distributed to laboratories around the world. The trenches provide a stable temperature environment, a feature important for the quality of the ice core sample. By the end of the 2017 field season, the drill had reached a depth of 893 m and operations for 2018 are currently well under way. It is possible to follow the camp’s daily activities at the field diaries section here.